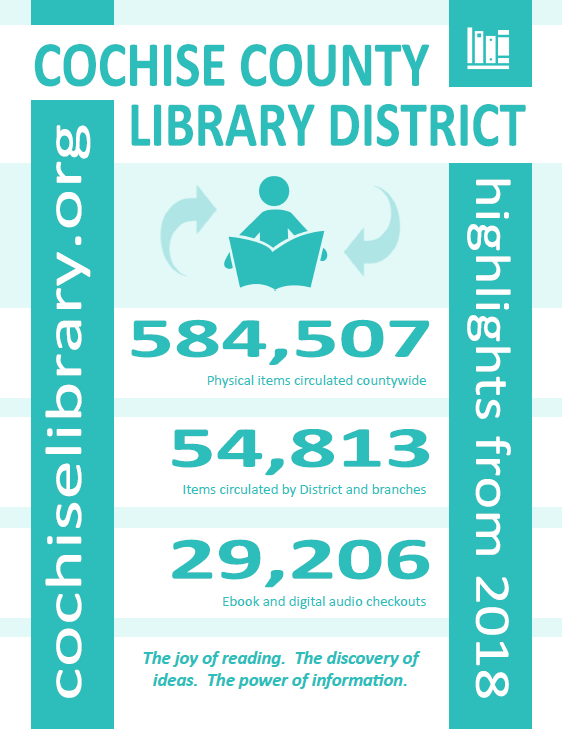 The Cochise County Library District is a cooperative group of libraries, working together to meet the information needs of customers all over the County. Member libraries include the seven independent city libraries and five Library District branches located in unincorporated areas of the County. For information about individual libraries, please visit the Locations page. If you have questions or concerns about the Cochise County Library District, please contact Library Director Amadee Ricketts (520-432-8935 / aricketts@cochise.az.gov). If you have questions or comments about the online catalog or digital resources, contact Systems Librarian Larry Scritchfield (520-432-8938 / lscritch@cochise.az.gov). The first Cochise County library services were organized in the early 1970s, when the Arizona State Library arranged for the Tombstone Library to stock and operate a bookmobile to serve rural communities. In 1975, the Cochise County Library became a department of county government. The office moved from Tombstone to Old Bisbee, on the middle floor of the Post Office building below the Copper Queen Library. In addition to continuing the bookmobile operation, Cochise County Library began to offer support services such as supplementary collections, interlibrary loan, and continuing education to the city libraries, and also to the volunteer-run libraries that were being established in several unincorporated communities. By 1980, Cochise County Library made formal agreements with the city libraries, defining county-level services, and also with the agencies which owned the buildings that housed libraries in Sunsites, Sunizona, and Portal. These rural libraries became branches. Throughout the 1980s, Cochise County Library developed its support services, adding a reference librarian to its staff, installing a link to the national interlibrary loan network (OCLC), and building collections through a series of state and federal grants. County Library offices were moved to the Old Bisbee High School in 1982. New branches were established at Naco (1982) and Bowie (1985). The Elfrida branch opened in 2003. The Cochise County Library became a Library District in 1986 according to a state law passed that year. In the 1990s, member libraries began planning for shared automation and started to build their machine-readable databases. In 1996-97, the Library District purchased and installed a countywide online system which integrates and streamlines daily staff functions such as cataloging and circulation to customers. The online system also promotes resource-sharing: customers at all member libraries can search the combined catalog and request items located at any of the member libraries. Bookmobile service was discontinued in early 2017 due to budget constraints, but the Library District still offers a full range of services for libraries and Cochise County residents. The Library District provides support services for libraries across Cochise County, including a shared online library catalog and a courier service to move materials between libraries. In addition to its support services for libraries, the Library District offers access to ebooks and digital materials, research databases, and Talking Books and Homebound services (the Mini-bookmobile) for residents who are not able to visit area libraries. Administration of the Library District is the responsibility of Cochise County. The Board of Directors of the Library District is the Cochise County Board of Supervisors. You can view more highlights and statistics from 2018 here. In May 2019, the Library District and member libraries will implement One County, One Card. This will allow residents to use an existing library card at any public library location in Cochise County. Read more about it here. The joy of reading. The discovery of ideas. The power of information. You will find the Library District's core policies below. If you have questions or concerns about Library District policies, procedures, or services, please contact Library Director Amadee Ricketts (520-432-8935 / aricketts@cochise.az.gov). The Friends of the Cochise County Library, Inc. is a citizen group formed in 1982 to increase public awareness of, and public support for, the county library system. Through memberships, donations, and other activities, the Friends raise funds so that they can support Library District collections and programs. Visit the Friends of the Cochise County Library District page for more information. One of the services the Cochise County Library District provides for libraries across the county is access to a shared online library catalog. In November 2017, the Library District transitioned from a very old catalog product (iBistro) to a new catalog called Enterprise. You can read more about the new catalog and its features here. If you have questions or concerns about the library catalog, please contact Library Director Amadee Ricketts (aricketts@cochise.az.gov / 520-432-8935). The Free Book Box Project is supported by the Arizona State Library, Archives & Public Records, a division of the Secretary of State, with federal funds from the Institute of Museum and Library Services. The goal of the project is to establish a collection of ten small Free Book Boxes in rural areas across Cochise County, to enhance community access to books and reading materials. For more information about the project, visit the Free Book Boxes page here.